Bread is such a fascinating bake. There is so much variety in taste and texture to be had. Thankfully there has been a revival of interest in real bread in recent years, spearheaded in Britain by the Real Bread Campaign. New techniques and methods are being invented or rediscovered all the time it seems. I’ve been making my own bread since I was a teenager – on and off. But it wasn’t until I attended a bread making course with Andrew Whitley a few years ago that I discovered, when it comes to water, more is definitely best. Wet doughs may be harder to knead, but generally give a much better result. I’ve been hearing about no knead breads for a while now. My own rye sourdough requires no kneading, but could this really work for wheat breads I wondered? I really kneaded (get it) to try it out for myself. Thanks to the unexpected delivery of a Lékué bread maker, I finally managed it. Lékué is a manufacturer of BPA-free silicone cook and bakeware from Spain. I was lucky enough to receive a bundle of their products to try out recently – you will, no doubt, see them popping up in subsequent posts. Their products are innovative, well thought out and of high quality – certainly the three I have tried so far have worked well. The Lékué bread maker is a strange looking piece of kit and I was a little sceptical when I first took a look. Having now used it, I am completely won over. It is basically a silicone bowl which doubles as a prover and baking tin, thus requiring little in the way of clearing and washing up. You can even knead the bread in the bowl and avoid having to oil or flour a work surface. The bread maker came with a few recipes, one of which was for a no-knead bread. It was time to try this new-fangled bake for myself. I adapted the recipe of course. I used a mix of half wholemeal spelt and half strong white flour and added a teaspoon of my rye sourdough starter just for luck. I also added some cocoa and molasses, which I thought would give a nice rich dark loaf – and it did. Weighed 200g wholemeal spelt and 200g strong white wheat flour and poured them into the bread maker. Added 2 tbsp cocoa powder, 1/2 tsp salt and 1 rounded tsp yeast. Made a well in the centre and added 360 ml tepid water, 1 tbsp molasses and 2 tbsp olive oil (and a tsp of sourdough starter which was more for luck than anything else). Stirred it all together until well mixed. Closed the bread maker using its nifty catch, then covered with a cloth and left in a not particularly warm room for 4 hours (time will vary according to warmth). Baked at 225°C for 15 minutes, then reduced the oven to 200°C and baked for a further 25 minutes. Turned the loaf out of the bread maker onto a wire rack in order to tap the bottom to test if it was done. It was, so I left it. This is such a simple bread to make with a great texture and so very tasty. I can see this becoming a regular on our table when we need something a little different to rye sourdough. The cocoa gave a depth of flavour without the bread tasting too chocolatey, which is what I’d been hoping for. The molasses added additional complexity and a little sweetness. I found I didn’t need to bake it for as long as the recipe stated, nor did I need to take it out of the bread maker and bake it upside down for the last 10 minutes. The recipe also warned that the dough should prove for at least 6 hours, but I didn’t notice that bit until it was too late. Luckily, it all worked out terribly well. We started the bread the day it was made (although the recipe stated to keep it for 24 hrs before using) to mop up our supper of shakshuka. As I’d hoped, it complemented this dish brilliantly. Having made a chocolate version of shakshuka once, I sort of thought it might. Over the next couple of days, we ate it as toast. It sliced well making few crumbs and was particularly delicious with poached eggs and then later with cream cheese and marmite. The bread maker is extraordinary, I’m really quite excited by it. No mess, no fuss, it’s a one bowl wonder. The washing up was minimal. If I had some digital scales, I wouldn’t even have needed to get those dirty. Admittedly, I made a no-knead loaf, so I am unable to report on how easy it is to knead in the bowl. But, quite frankly, why knead when there is no need? It’s hard to believe that bread could get much better than this no-knead loaf. Thanks to Lékué for the bread maker given to me to try. There was no requirement to write a positive review and as always all opinions are my own. oh I love that bread maker thingy – what a clever idea!!! Cocoa bread – how lovely for you. Here’s a recipe for you to try – cocoa eggy bread. When it’s gone a little stale (if there is any loaf left) dip into an egg and cocoa mixture and fry up 🙂 Our favourite. Loving the look of the handy bread maker, too. That sounds amazing Ren, going to jot down in the memory banks for my kids (and me!). Haven’t made eggy bread for years Ren, but will most certainly have to try it now. your loaf looks gorgeous!… i’m so glad you’ve discovered this method, it is my ‘go-to’ loaf every time now as it’s just so simple and is pretty much faultless… you will never look back! WOW! That looks amazing and I am fascinated by your mould too! Bet that bread will make a FAB bread and butter pudding if you have any left that is! What a cool looking bit of kit! ? What a brilliant shape it comes out, like a bullet! I’ve got the same mould but not used it yet, can’t wait to try it out. Looks fantastic! I recently baked my first no knead bread with grated cheddar cheese and it turned out so good that I’ll be definetely making more soon! Oh chocolate bread, mmmmmmm! I must go look at their products, they sound interesting. I have to get back to baking bread again. There is nothing like it! I like the sound of the breadmaker, as well as your no knead cocoa bread. I’m a big fan of baking bread, something very relaxing about it. What an interesting concept. It certainly seems to have worked well, the bread looks lovely. Interesting. Never tried spelt with cocoa. very nice Choclette, I have got some stuff from Lekue too, including the bread basket/cooking basket and I do love your cocoa bread here. the bundt cakes you made using their mould have looked fab too! This sounds like a very interesting kitchen gadget! You bread looks and sounds wonderful (and so easy!). I love the idea of cocoa in bread. I really must try it one day and this seems like the perfect recipe for it. I am intrigued by this breadmaker as have read several good reviews now. 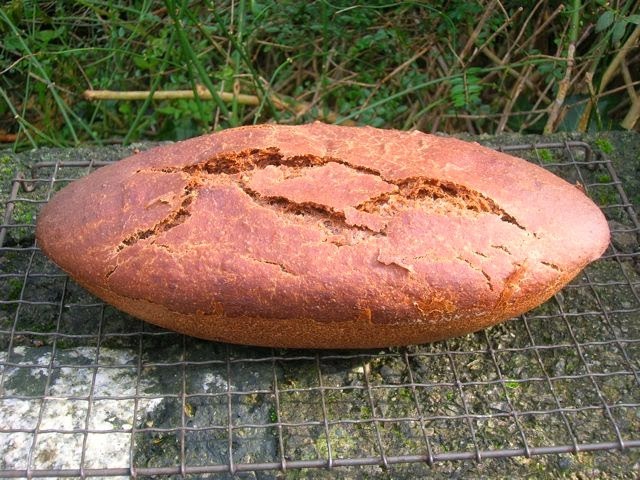 Love the idea of cocoa bread, especially when made with spelt. Adding cocoa – what a yummy idea! !